Best for: Women ready for a new chapter but who need a little encouragement. Not for: Men, luxury lovers or anyone requiring deep-rooted healing. An Advivum journey is a self-discovery process that reconnects you to your authentic self, re-igniting passion and purpose so that you return from the seven-night retreat with the glow of inner wisdom that will guide you towards life’s next stage. Hosted at the Hui Ho’olana on the ‘Friendly Isle’ of Molokai in Hawaii, ‘The Re-Imagined Self’ emerges through a combination of life coaching with Advivum founder, Canadian-based coach Tania Carrière, facing your image with photos taken by National Geographic photographer Dewitt Jones, and learning to dance the hula. The process starts three months before you land in Molokai, with workbooks, videos and a coaching session. It’s an inspiration. There’s a pre-application interview to ensure that all participants meld together supportively to enjoy a joyful and transformative sabbatical for the soul. The jetlag if you are coming from Europe: it’s a 12-hour time difference. Book it in around an extended stay if you are able. 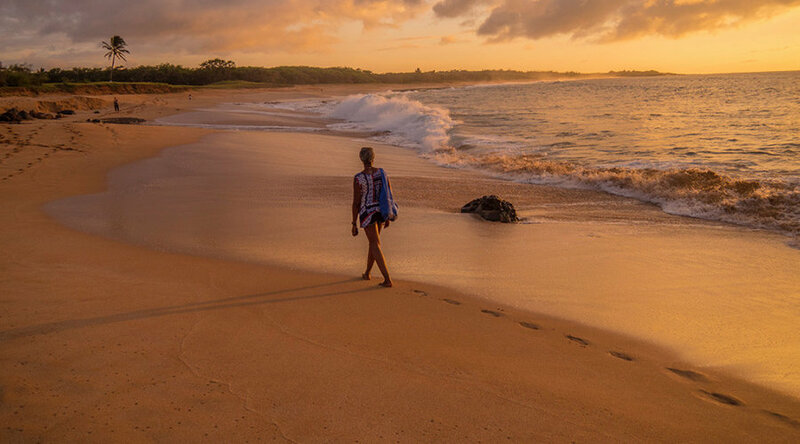 On the friendly Hawai’ian isle of Molokai, Niki Natarajan reviews Advivum Journeys’ transformational retreat where through hula, candid portraits and life coaching, her Re-Imagined Self is ready to rock the second act. 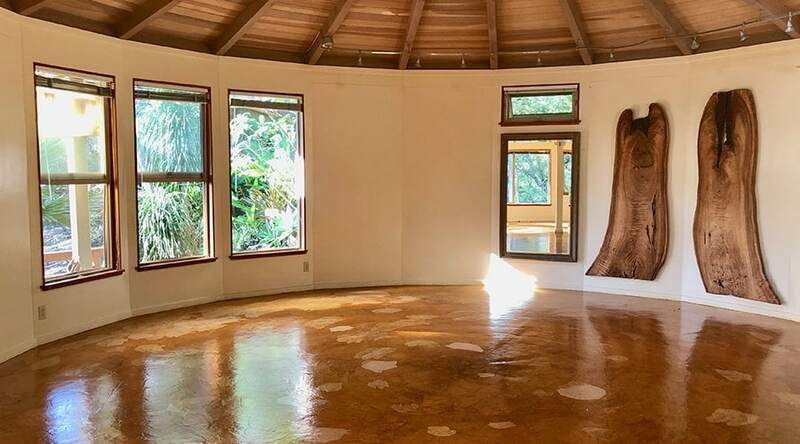 The seven-night Molokai retreat is centred around mandatory group life coaching exercises, daily journaling, hula lessons in the afternoon, and three group excursions (sunrise, sunset and a surprise), all witnessed photographically by Dewitt Jones. 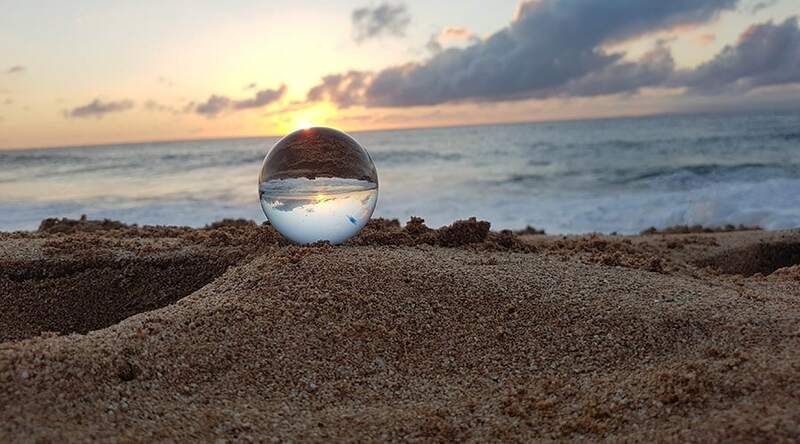 There are two free half days to explore the beach, town centre or hang out on the estate and enjoy a massage, as well as free time each day to swim in the pool, relax in a hammock or take an outdoor bubble bath in one of four vintage tubs with a view. 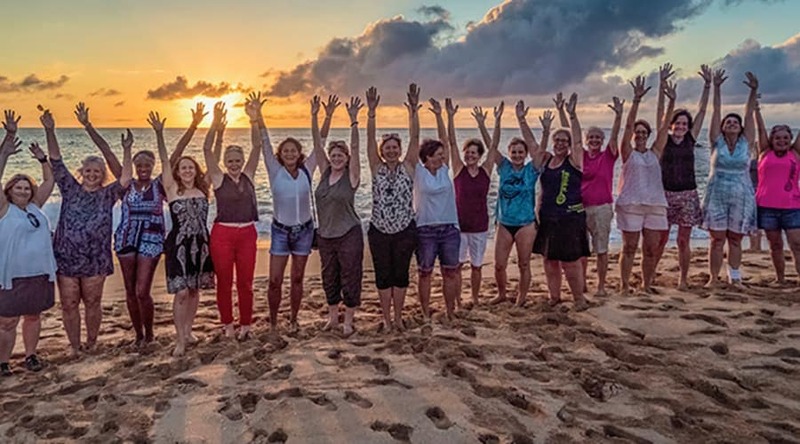 The ‘Re-Imagined Self’ process starts three months before you land in Molokai, with four workbooks filled with exercises and a one-hour coaching call with Tania Carrière all designed to elicit where you are now and who you want to be for the next chapter of your life. There are contemplation exercises and YouTube videos by inspiring people such as Brene Brown to help to encourage the habit of journaling. One month after the retreat there is a fifth and final workbook, and towards the end of the year another one hour one on one coaching call to check in on progress and discuss challenges and next steps. You’ll also have the chance to stay connected to and supported and inspired by the sisterhood that forms via a private Facebook page. Central to the ‘Re-Imagined Self’ retreat are five workbooks, daily journaling, two private coaching calls and interactive group work on location. Together with a meticulously organised structure, Tania Carrière and two additional professional life coaches bring heartfelt friendship and joie de vivre that allow participants to feel safe as they release their redundant sense of self. Canadian by birth, Tania, an avid traveller, developed a life-long commitment to self-discovery when she lived and worked in France aged 18. With a Masters in Public Administration, her corporate journey started in 1995 in a boutique consulting firm in Ottawa that facilitated business transformation and change management. Since then Tania, who has a background in psychology, has been working as an executive coach and consultant focusing on organisational development for large groups and leadership development for executives in support of ongoing change and the realisation of passion and fulfilment. She’s now turned her passionate attention to individuals. 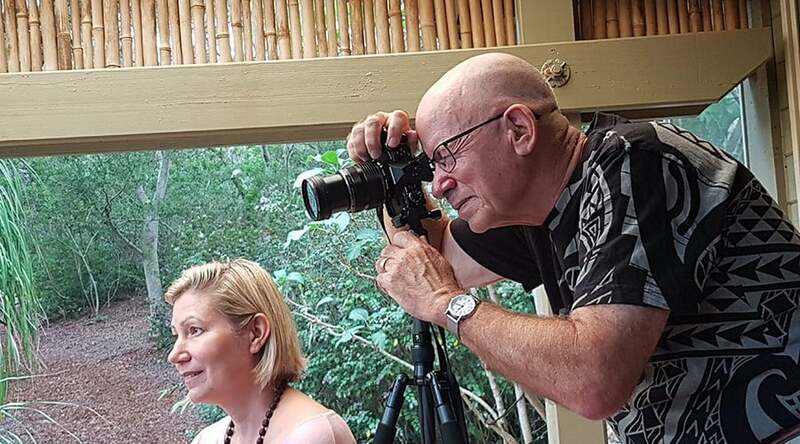 Using candid photographs taken throughout the week, award-winning former National Geographic photographer and Academy Awards-nominated documentary film producer Dewitt Jones captures the many faces of each of the participants as they reconnect with their different selves. Discussions at an individual level and group slide presentations help to remove the self-criticism that blocks access to releasing full potential. You are sent all the photos of you to keep via Dropbox as a memory of the trip. At the start of the week, you are asked to sign a photographic release waiver so that photos of you can be used for Advivum’s social media and marketing. After 20 years of photography for the National Geographic taking photos to ‘Celebrate What’s Right in the World’, Dewitt now leads Celebrate What’s Right, an online community of photographers and bloggers that invite people to see life from a place of abundance and joy. During the retreat, Dewitt gives two talks based on his life and how through images and words we can transform the way we experience the world. Movement is an essential component to integrating learning and transformation, and on this retreat hula is used as such. Hawaii’s ancient storytelling dance is a set of simple repetitive steps (four count to the left and four to the right) and arm movements put together to bring to life the words of local songs such as Pua Mana. Coordinating steps, words and arm movements is almost secondary to the carefree sense of joy and sisterhood that this group activity incites, primarily because almost certainly everyone is a novice and therefore likely to be experiencing the same feelings of beginner’s confusion. 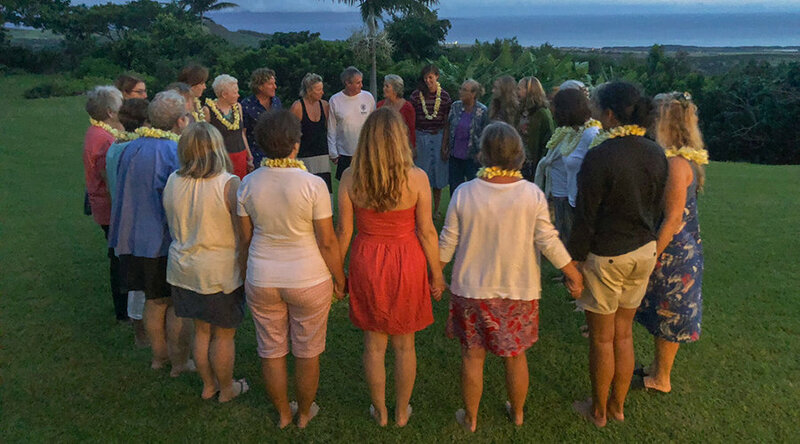 Lynette Sheppard, author of Becoming a Menopause Goddess, teaches the fluid movements of the hula each day on this retreat as a way to reflect on how we dance in our lives and also to share the culture and life lessons contained in the dance. There are two short and simple yet profound daily rituals, one in the morning that involves everyone reading a stanza of a poem, and one in the evening to acknowledge and honour every individual’s feeling at the end of each day. Group excursions are also part of the retreat experience and include a trip to watch the sunrise over Kalaupapa bay, followed by the morning’s ritual at the sacred fertility site of the Phallic Rock; watching the sun set on Papohaku Beach; and a unique surprise at a privately-hosted musical event. In a dedicated massage hut, external highly skilled massage therapist Rosine Stout, can be scheduled to offer simple massages and body work. 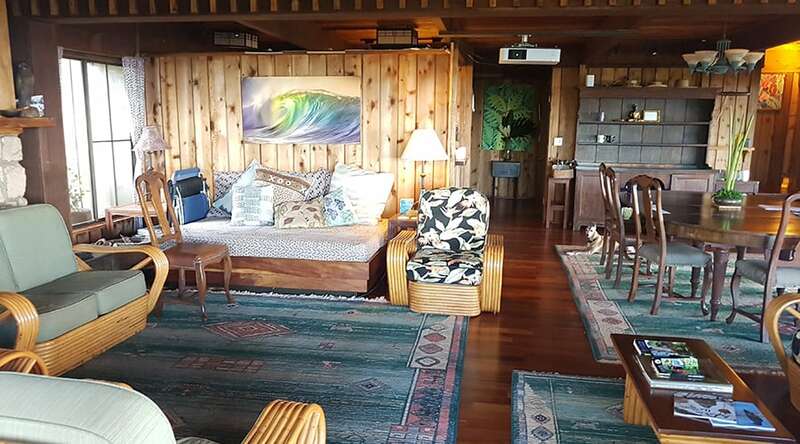 On this retreat you practice Ohana, which in Hawai’ian means family (in an extended sense) and is the practice of offering time to support the household needs of the retreat and part of the community-living experience. Staff and guests all participate in karma yoga on a daily basis. Guests are given a small job like sweeping a deck, wiping the tables after meals, keeping an eye on the communal bathrooms or making coffee. It is a fun way to feel truly a part of your group experience, and the volunteers appreciate the contribution. 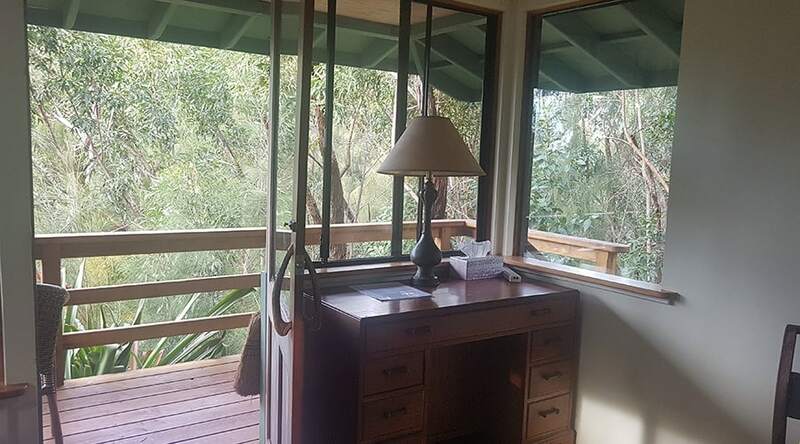 Bedrooms: There are four rooms in the main eco lodge – two single rooms with vintage furniture and bookcases, and two shared rooms on the mezzanine, all with shared bathrooms on their floor. 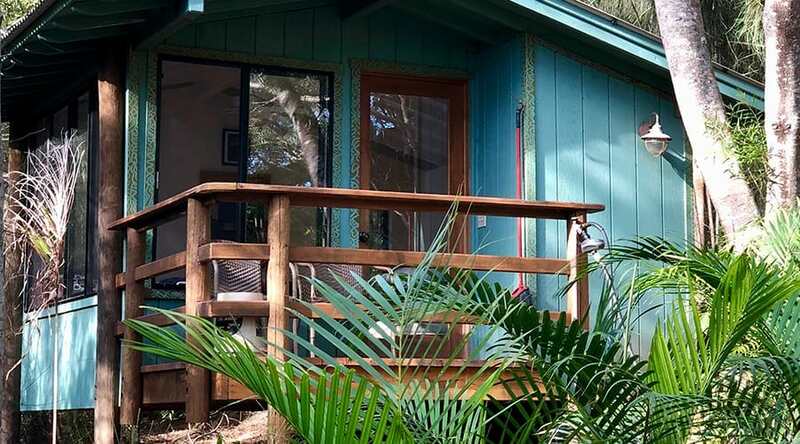 Or choose one of five tropical basic forest cabins, each with a balcony and large windows, designed for sharing with two beds, a desk and clothes-hanging space. If you require alone time, it is worth booking one of the ‘return to nature’ cabins with shared outdoor shower facilities. All rooms come with tongs to remove insects, such as caterpillars, without harming them, and ammonia in case of an insect bite. All of the rooms have shared bathroom facilities with basic shower gel, shampoo and conditioner to use should you forget to pack your own. Other places to be: Unless you have a solo room or cabin, the personal spaces where you are alone are anywhere on the extensive grounds. There is a meditation garden, numerous benches hidden around the property, a hammock by the pool and long trails to explore the forest. 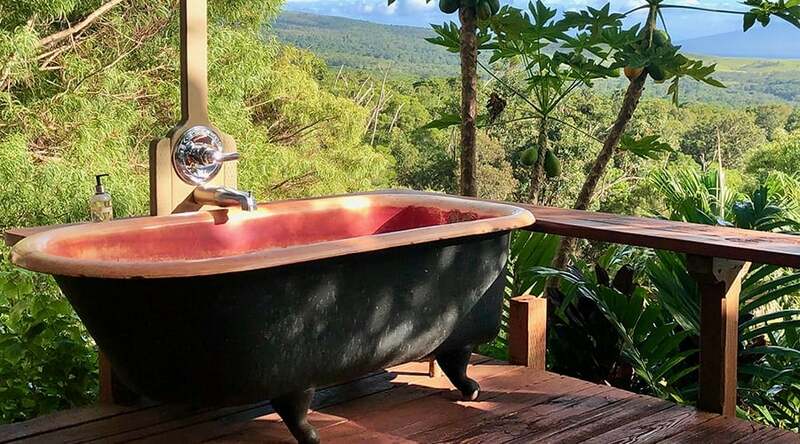 One of the unique aspects of the Hui are the four vintage bathtubs dotted around the grounds, ideal for warm relaxing bubble baths under the stars. Pack light: towels, basic shampoo, conditioner and shower gel are provided and living in yoga/sports gear all week is more than acceptable. It’s worth arriving at least a day or two earlier from Europe to counter jetlag, and aim to stay on Molokai a few days after to process in peace. 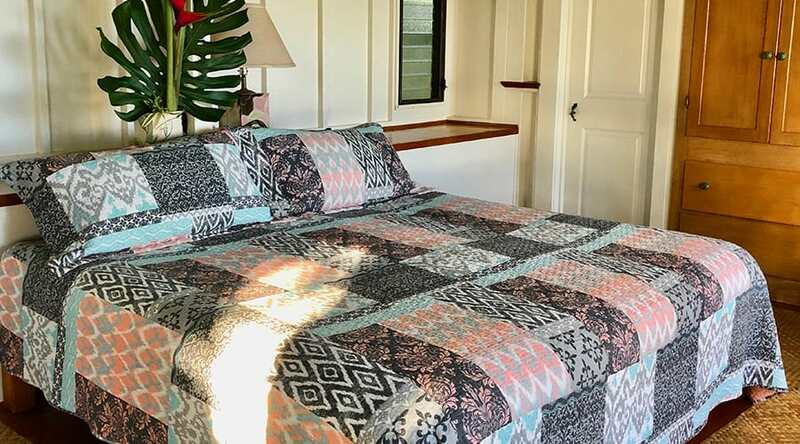 It is not possible to stay at the venue, so most people who want to stay on the island typically invest a night or two at the beach front Hotel Molokai, or explore AirBnB options. There are two airports on the island – make sure you land at Molokai (MKK), not Kalaupapa Airport (LUP), which is on the other side of the island for the residents of the Kalaupapa National Park, a former leper colony and for which you need formal documents to enter. If you have to spend time in Honolulu, book a Queenly massage at the Moana Lani Spa and spend the day at spa complex away from the crowds. The venue is open from September to June, but the Advivum Journeys retreat is usually held towards the end of the year, or in January. 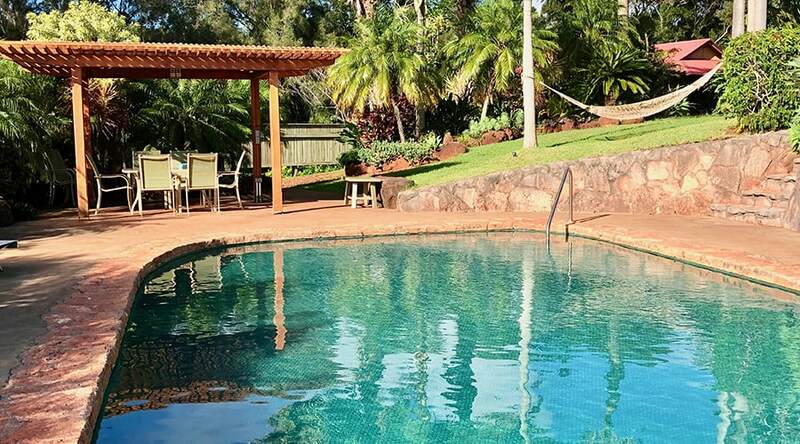 The weather in Hawaii is typically the same all year around, warm and sunny, but the Hui Ho’olana is 1350 ft above sea level so cooler than the coast, particularly in the evening, so pack a fleece and an umbrella for the light rain and occasional showers. Outdoor spaces: Eli’s Yurt at the end of a path before the trails begin is a large wooden yurt where indoor coaching takes place. This space can also be used for personal yoga (mats and meditation cushions can be found in the cupboard), movement or dance practises. 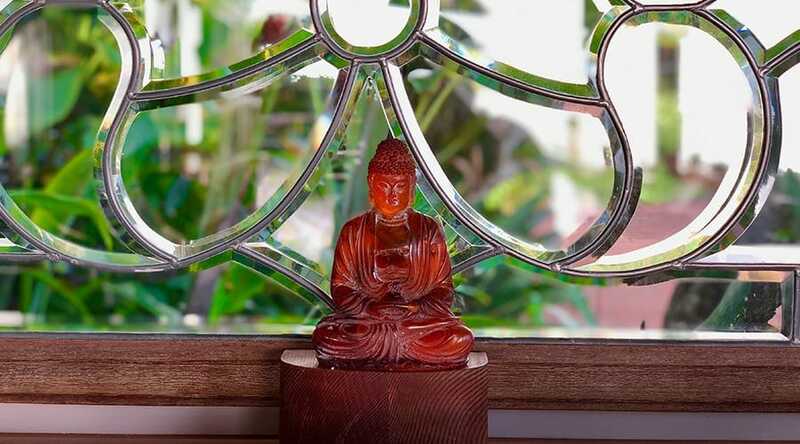 On the sea view veranda there is a relaxed seating area complete with soft cushions and a welcoming orange buddha that is perfect for journaling outdoors or chatting with new found friends. The Peace Pavilion is a covered open air space where the afternoon hula classes and occasional coaching sessions take place. The pavilion has windows and deep window seats on two sides with cushions and back support, perfect for reading out of the sun’s rays. Outdoor pool, hot tubs & garden: The chlorine-free pool, which uses ionisation for an odour free swim, is situated outside the lodge with sun loungers and a pergola covered area with a table and chairs. By the pool overlooking the sea below is one of the four standalone tubs. Swimwear is optional. 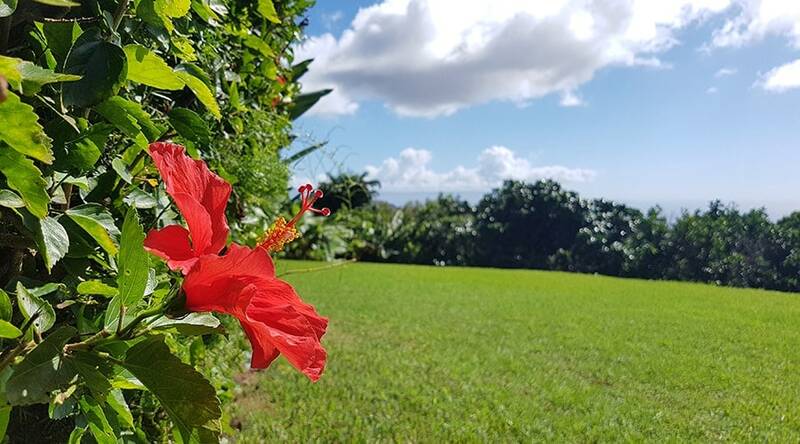 On the grounds Hui Ho’olana has a native botanical garden where numerous endemic species are cultivated in an effort to stem the tide of extinction. It also cultivates fruits, herbs and vegetables that form part of the organic meals served. Indoor spaces: Inside the lodge, which you enter without shoes, is a large communal room where evening coaching and lectures take place. It has three sofas and numerous armchairs for relaxing, reading, journaling or catching up with friends. The onsite gallery space offers the work of the resident on-campus artist, Arlinka Blair, as well as art work and photographs by other photographers and artists in the area. Books, clothes and jewellery are for sale as is The Spirit of Food, the Hui Ho’olana Cookbook. The sofa and outside seating offer more areas for contemplation or journaling. Unless there is a storm, all meals are typically eaten family-style at one of seven tables on the L-shaped covered sea view veranda. Three delicious healthy meals are prepared in a large kitchen and presented beautifully as a self-service buffet. Food, which where possible is organic and wheat free, is predominantly vegetarian but supplemented by eggs, chicken and local meats. Home grown salads topped with edible flowers are served with a choice of three home-made dressings. At breakfast, granola and different types of home-made bread offered with passion fruit curd, jam, honey and butter are a staple. In addition to a selection of sliced local fruit (papaya, pineapple, banana or dragon fruit) one breakfast menu was organic steel-cut oats with strawberry mango compote, fruit and nut muffin and poached eggs over a sweet potato and wild rice medley. Lunch is lighter, for example, roasted butternut squash, carrot, and almond salad, baba ghanoush with pita bread and Moroccan bean and rice salad. The evening meal one night was Hui nut loaf with miso gravy, steamed broccoli, oven fries, and hui salad and coconut chia parfait for dessert. Filtered water and cold flavoured teas are freely available all day, as are hot teas and coffee. Whilst alcohol is not sold at Hui Ho’olana guests are free to buy it in town and store it in the communal fridges. The Hui is a not for profit venue that recycles, supplements electricity with solar power, uses wax cloth instead of plastic to cover food, bamboo flatware for picnics, collects rainwater for the garden, grows salad, herbs and fruit and the paper towels are biodegradable and 100% recyclable. In addition to reintroducing more than 20,000 native plants, the Hui is home to the largest private restoration of dry-land forest within the State. Tania is a gifted master in supporting others on their journey to embracing and becoming the person they were born to be. Her thoughtful attention to every detail of the retreat was extraordinary. During our introductory phone call, I immediately felt heard and appreciated Tania’s questions and insights and the nurturing way she offered them. This experience continued throughout the retreat and certainly fostered introspection, clarity and breakthroughs in my own self-induced glass ceilings. Tania’s carefully created workbooks, designed to help us prepare for the retreat, were inspiring and thought provoking and heightened my enthusiasm for the process of re-imagining my self. 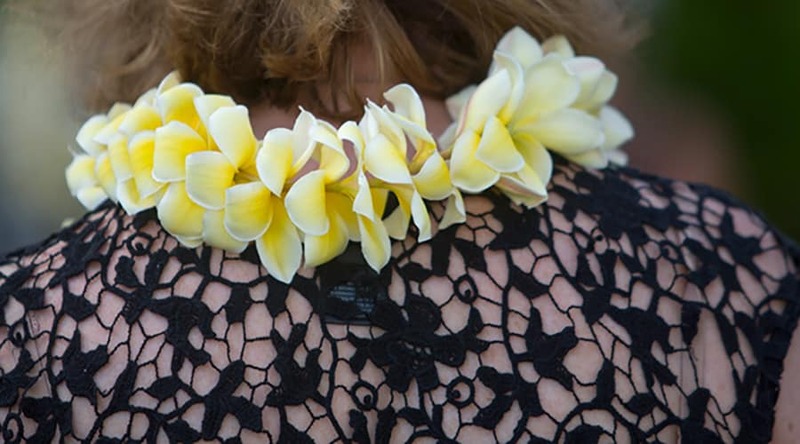 Many people greet with open arms but, on arrival at the Hui, I felt greeted and embraced by the spirit of Tania’s open heart – which was further reflected in her personal gift and note left on my pillow. The sweetness of those moments lingers in my heart today. I thought Tania intuitively held an appreciation for the greater self in each of us: that calling/yearning deep within each of us, which drew us to her retreat, but that which we were not yet able to fully own and embrace ourselves. Each day’s schedule and activities were rooted in Tania’s wisdom as to how to best nurture us on our journeys. 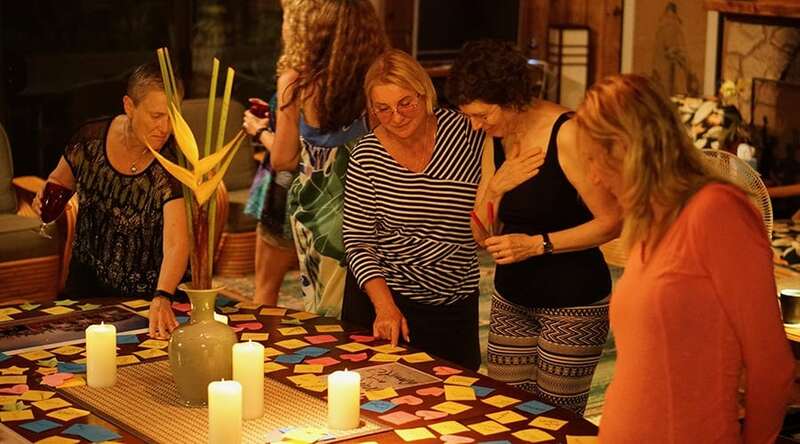 Sacred space, rooted in unconditional love, was held for participants to authentically share the highs and lows of our experiences and processes. Day by day we progressively weaved our own unique threads back and forth across our circle so that, by the end of the week, we had created a beautiful tapestry bound by our newly formed sisterhood and our Re-Imagined Selves. I came to this retreat with mixed feeling about myself. At age 74, I was certainly happy with my life’s journey and all that I had accomplished in many ways. My spiritual journey had brought me to a place of experiencing inner peace, gratitude and bliss. At the same time, there was a feeling that, “I’m not done yet. I have more to offer.” I was feeling stuck and at a loss as to how to proceed. Tania’s “If not now, when?” was an incredible wake-up call to this senior citizen. It jarred me at the core of my being and prompted a gigantic “YES” to attend her retreat. Everything that Tania offered our group was extremely helpful to me, however, my one-on-one coaching sessions with her went to a much deeper, core level: I appreciated her profound insights as to who I really am and her masterful guidance in helping me open up to and embrace the magnitude of that reality. Delightfully, she was also very pragmatic and offered (many fun!) suggestions and tools to help me sustain my evolutionary process. How has Tania’s “Re-Imagined Self” affected my journey? It has provided further affirmation that the journey is not about trying to change who we are at our core being but rather to continue to awaken to and nurture the beauty of our unique gifts. The changes we need to make are about our attitudes, the tools we choose to use and the choices we routinely make to empower and support us on our journey to our True Self. I thought my self-care had been quite good but I am now finding myself engaged in even more profound and nurturing ways to care for and honor myself. We came together as women from diverse backgrounds. Individually and collectively we began to spread our wings and experience our own empowerment. My journey to saying yes to this retreat had its roots in an intense travel experience in Guatemala that exposed me to amazing Mayan women learning a new to them artistry – rug hooking – as a way to make a better life for them and their children (Multicolores.org). But it was not just the Mayan women who inspired, it was the nonprofit workers on the front lines of helping to make a real difference that were inspiring and thought-provoking to my own life. And that planted the seed that began to grow and ask a frightening question- is there more to my life that what I am experiencing … more than what I present to my family, my friends, my colleagues? And the answer was a rather timid I think so. When the email from Dwight Jone’s “Celebrate What Is Right with the World” arrived months later introducing me to Tania and this retreat I was ready for help and felt stuck on my own efforts to move forward. Well after I sent to it someone else first suggesting it was perfect for them and their life! Except, it kept coming back In my mind so I spontaneously cancelled a trip to a long awaited destination and said yes I am ready for this personal journey to answer my question. The work pre-retreat in the form of questions and exercises is an important part of the experience and opening yourself to possibilities you might otherwise discard. I arrived at the retreat center easily because I had been there before on a photography workshop with Dwight Jones and others. The very first night signaled this would be a different experience – no discussion of what you do for a living. Not that I can ever explain it without watching eyes glaze over in two minutes tops but it is a huge part of my life and why I ignore so much of the rest of my life so that was interesting for what else do I say in introduction to others? From there all of the exercises, journaling, discussions – even the Hula- were carefully curated to encourage you to strip away the outside layer that keeps your imagination narrow and your life in a box and dig into when all that is “the now” falls away who are you and what is your passion? Having spent at least 30 years actively ignoring this question and sending that little voice who dared to ask it to last place in a crowded life of priorities, obligations and other must do’s, that voice needed the space and encouragement to speak up. After all, I had ignored her rather than nutured her for a lifetime. And that is one of my key takeaways from this retreat and the amazing women I met- I am encouraged that this is a life journey I want to take, can take and am taking. I learned some very valuable tools to quiet my analytical mind and goal-oriented lifestyle to make space for a more fulfilling life to emerge and the exploration of what if? And now, several months later, the journey continues and the little voice is a bit louder and growing bolder and more confident every day and manifesting in action. I am truly enjoying what is unfolding on my journey and leaving the destination as a surprise. In short, this retreat provided me the opportunity to start a life-changing journey and I am so grateful. I am 69 years old and recently retired due to my husband’s illness. 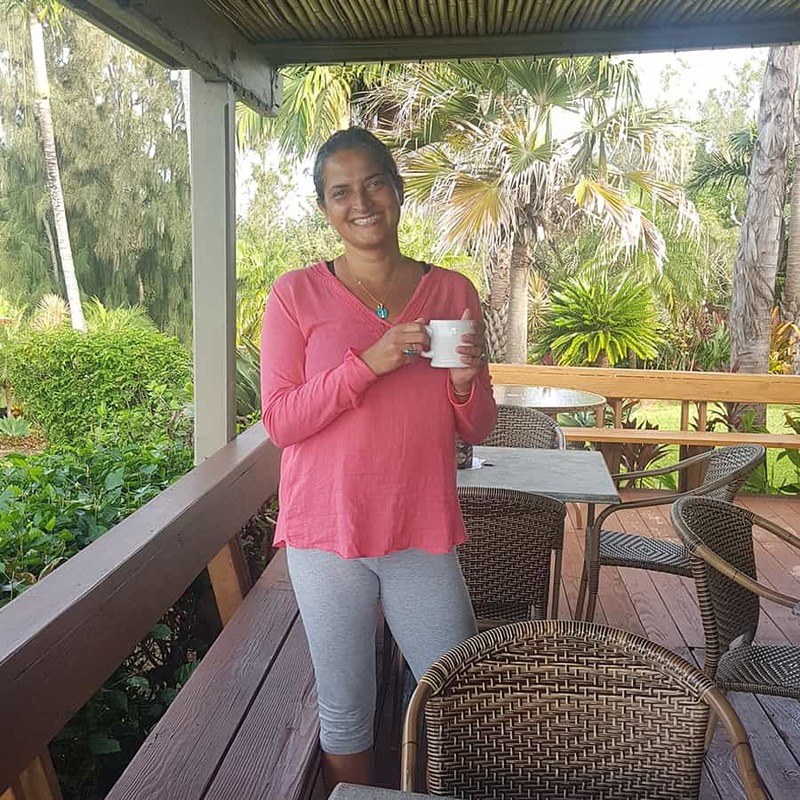 I attended the retreat “The Re-imagined Self” in October, 2018 on Molokai. I was intrigued by Tania’s writing and creativity and I was thrilled with the opportunity to work with her and Dewitt Jones again in a retreat setting. The retreat was an early birthday present to myself. I didn’t know quite what to expect but knew it would be terrific! The other reviews already posted here so very eloquently described our experiences on the island that I won’t repeat what has already been shared. I will say that the workbooks 3 months ahead of the retreat provided pre-work that really set the stage for the week. From the moment I arrived I knew this was going to be a magical experience! And not one aspect of the week disappointed. From the setting and the nurturing care of the facilitators and the staff at the Hui to the unique design of the activities … all blended and flowed as meant to be. The chemistry between Tania, Fi, Lisa, Dewitt and Lynette was wonderful to see. Between them they created a safe and accepting atmosphere for us to know and share our hearts and minds with each other to whatever degree we wanted. Over my years in my professional and personal world I have attended, designed and facilitated many, many retreats. This was the best and most memorable. There was deep learning in every activity, every tear and every peal of laughter! And I saw my FIRST shooting star in the night sky over Molokai!